One of my favorite posts ever by one of my most favorite bloggers ever. Thanks for sharing with us Britt! I came across an article the other day (and don’t you know I can’t remember where in the world it was) that talked about having kids. I mean reallllly having kids. It was so brutally honest. Not much fluff or political correctness, just real, true life with kids. The girl that wrote it really needs a high-five. She talked about the need for moms to be totally honest about life with kids. Not to hide behind a smile and pretend that everything is fine, or that you’ve got it together. Just to be honest. 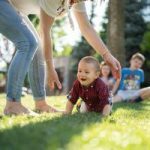 If more people were real about motherhood, we’d all probably feel a little more normal (or at least I would). I don’t have it all together. In fact, I’m not quite sure I’ve had ‘it’ together since PB was born. And some days, I want to lock myself in the bathroom and sit in silence. And some days, like when he throws a fit in Target, I get so frustrated that I want to cry and throw a bigger fit. And sometimes, I want to sit on the couch and watch 30 uninterrupted minutes of a TV show, while eating a bowl of ice cream without sharing it. Yea. I said that. And sometimes, I want to go to a restaurant without having to scarf down my food in 2.1 seconds. Motherhood is not for wussies. It is such a strange bird. No one can make me want to scream at the top of my lungs like my son. And no one in this world can make me more happy than my son. Sometimes, I feel so unnatural with motherhood. I love my son more than anything in this world. He really is the center of my life. But a lot of times, I feel like a failure. I feel uncoordinated, and ungraceful. Even with PB at 1 1/2 years old, there are still some days when I feel like I can barely hold my head above water. And I’ve only got one kid! We went to a new church when we visited Ben’s mom last week. PB lasted about 10 minutes in the service before he was laying in the floor, whining, and trying to crawl under the seats. Literally two seats down from us sat a kid who looked close to PB’s age, and he didn’t move the entire time we were there. He sat in his own seat, and watched the preacher on the stage. Ugh. I couldn’t help but wonder what was wrong with me. I started to get hot. My face was getting red. Beads of sweat started popping up. I felt like everyone in the crowded church was staring at me, wondering what kind of hellion I was raising. I wasn’t holding it together. Any mother in the room could clearly see my frustration. I was literally pouring the sweat, trying to climb under the seats to grab my kid. I managed to grab his foot, and I literally dragged him out from beneath the seat, kicking and screaming. Nobody told me about this. Sure, people said parenting is a hard job, but even when they said that, they said it with a smile on their face. And what’s worse, is that I can’t mask it. I can’t smile or gracefully pull my child from the floor of the church. 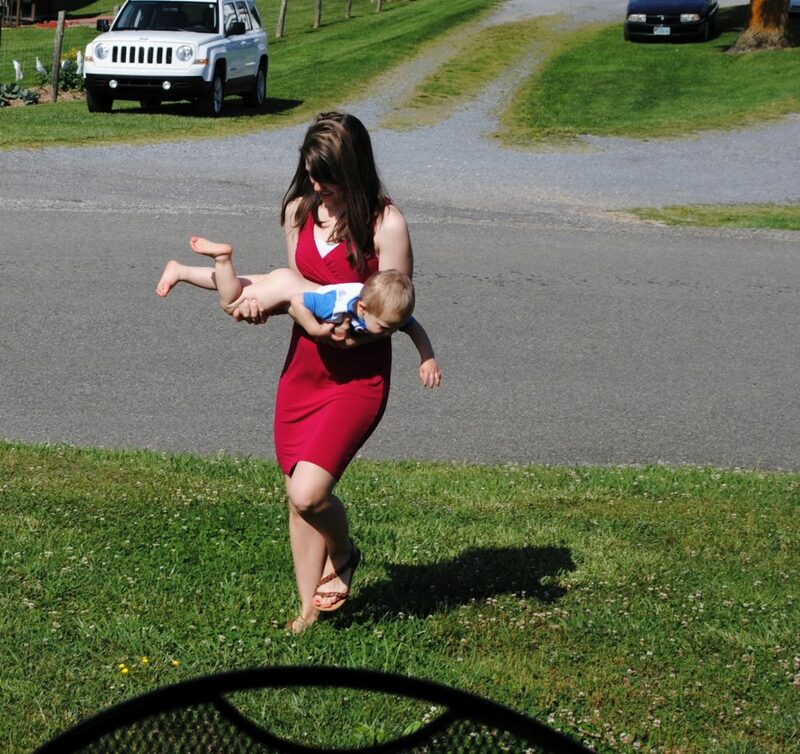 I’m the mom whose dress is tucked in her underwear, mascara is running down her face, and bangs are glued to her forehead, while she’s dragging her kicking, screaming son by one leg out from under the church pew. But because I’m ungraceful, or unnatural, doesn’t mean I love my son any less than the mannequin kid’s mom. The truth is, I love deeper than I ever have before. I would not hesitate one second to do or give anything for my boy. He is what my world revolves around now. Being his mom is the best thing I have ever and will ever do. I just won’t look that graceful doing it. I might cry when I’m frustrated because he won’t nap. And I’ll still want to scream when he throws a tantrum. And I won’t feel guilty for wanting 10 minutes of sanity to eat my own dern bowl of ice cream. He’ll make me want to pull my hair out, and as he gets older, I’ll make him hate me a few times. I’ll never look graceful, and I’ll never be able to hide my failures behind a smile. But with God’s grace, we’ll be just fine. Am I in this boat alone? Any other ‘ungraceful’ moms out there? Do you secretly want to watch just one uninterrupted rerun of ‘Friends’ while NOT sharing your bowl of ice cream? Wow! This. Is. My. Life. Thank you for sharing because I sure do feel alone sometimes!!!! Glad to know my almost 2 year old boy is the same exact way and I feel the same exact way but boy do I love him! I believe this is the story of most mom’s! As you know, I have three children ages 5, 2, and 10 months. Wow! When I had my first child I felt exactly like you feel. I would get frustrated and even cry, often more than I smiled and sometimes over the smallest things. I felt like I had failed her in some way when she would throw those tantrums at Walmart and everyone starred at me like I was the bad person. When I would see children riding in the buggies and not making a sound, I would often wonder how that mother accomplished that. What was she doing differently than I? It makes you feel so ungraceful, as you say. Boy, did she ever test me and still does, but I love her more than words can say. 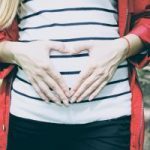 After I found out I was pregnant with my second child, I thought how can I go through this again? Will this one be like my first and test me on every hand? Will I ever get to see a moment alone or get to eat my bowl of cereal without sharing? All of the same questions that you ask yourself. When he arrived I was over joyed, but very tired. I was thankful he was healthy and had arrived, but was sure that I would never ever have time for myself. How was I going to handle a rambunctious 2 year old and a newborn? It is not easy! Not with one and definitely not two. In the beginning it was not that bad because the baby ate and slept. After he became mobile it got interesting. Now instead of having one child into everything, I have two. When one throws a fit so does the other one. I, like you, am the mother in the pew sweating bullets and anxious about what may happen or is happening. And yes, the second one tests you just as much if not more than the first. I have to say, that after my second child became mobile I realized that I didn’t have to be perfect and neither did my children. I still fret at times, but nothing like I use too. If I feel that it is getting to be to much for me to handle I schedule a date night with my husband or just time for myself. You do need time to eat your bowl of ice cream and watch a TV show without interruption, so don’t feel bad if you do take the time because you need it for your sanity. Keep in mind, that it took two children for me to realize that it was natural for my kids to throw tantrums, throw food, kick, scream, and so forth. Then, after I found out I was pregnant a third time (surprise), I didn’t know what to feel. I was anxious, even scared. That pregnancy was almost unbearable with two little ones running around, but I made it. When he arrived it was like I had a new sense of myself, a fresh breathe of air. It was strange. I was so comfortable with him and felt free. I think I had finally found my patience, or at least more of it. Well, needless to say, you can probably imagine how interesting my days are, especially when we venture out in public. Usually, instead of one tantrum there is three. Yes, I still have melt downs and cry at times, and long for the time when my husband comes home from work so he can help out, but I love my children more than anything else on earth and would walk through fire for them if I had too. Parenting is very interesting. It challenges our emotions, our feelings, and our actions. Buttons get pushed that we didn’t even know that we had, but at the end of the day it is the most rewarding experience that we will encounter here on earth. I believe that most parents have probably experienced the way we feel. When I hear parents talk about how good there children are and that they never get into anything, I wonder how that is because every child that I have come in contact with is curious about everything. All I can say is that in our society today, there is a lot of emphasis on what other people think about us when in all reality it shouldn’t be. None of us are perfect at anything we do, but as long as we strive to live for God and not those around us we will be okay. I admire you for your story and your honesty. It is all so very true. My Mamaw always said, “that parenting was a test of God” and that the answer was always LOVE! 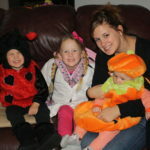 Hey Buddy!, I found this information for you: "Guest Post: An Ungraceful Mom". Here is the website link: https://chauniebrusie.com/guest-post-an-ungraceful-mom/. Thank you.